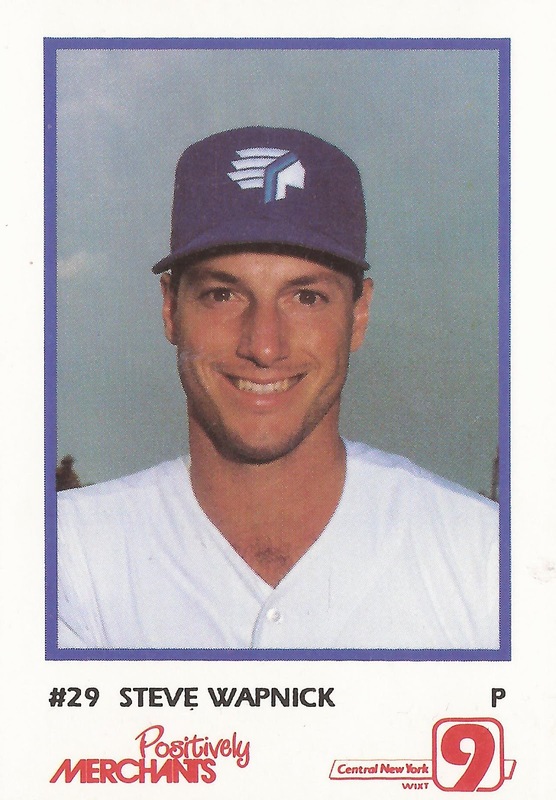 After two-plus seasons at single-A, Steve Wapnick made a rapid ascent in the Blue Jays system, first hitting AA Knoxville, then AAA Syracuse. And his new Syracuse manager Bob Bailor told The Los Angeles Times he'd heard nothing but good things about his new relief pitcher. "He goes after hitters," Bailor told The Times. "He's real aggressive and that's what you want out of a relief pitcher. Personally, I want to get him into a game as soon as possible to get that triple-A tension out. I don't want to put him in a position to lose a game and mess up his confidence." Wapnick would make the next step, but not with the Blue Jays. He took that next step the next April, with the Tigers. He got into four games for Detroit that April, and six more with the White Sox in 1991, marking the extent of his major league career. Wapnick's professional career began in 1987, taken by the Blue Jays in the 30th round of the draft, out of Cal State Fresno. He played that year at short-season St. Catharines, going 3-4 with a 3.02 ERA. He played 1988 at single-A Myrtle Beach, posting a 2.24 ERA in 54 relief appearances. He also picked up 12 saves, and spent one rain-out sliding in the mud. For 1989, Wapnick made that rush to AAA. He started at single-A Dunedin, moved to AA Knoxville and then AAA Syracuse. He got into 12 games for Knoxville and six for Syracuse, posting sub 0.70 ERAs at both. That off-season, the Blue Jays left Wapnick unprotected, and the Tigers took him in the minor league draft. "Toronto's a great organization with a lot of numbers," Wapnick told The Associated Press early that next April. "I just fell between the cracks." In four outings, seven innings for the Tigers that April, Wapnick gave up five earned runs. The Tigers then offered him back to the Blue Jays. He spent the rest of the year back at AAA Syracuse. 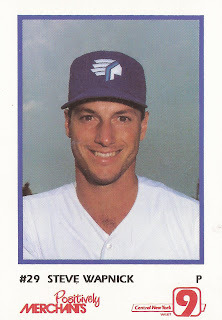 Wapnick spent 1991 again at Syracuse, without getting a call-up to Toronto. In September, the Blue Jays sent him to the White Sox. He got into six games for Chicago, giving up one earned run in five innings. Going into 1992, Wapnick was hoping to make the big club again, having a good enough spring to be in the conversation. "I thought if I pitched well, I thought I'd make the club," Wapnick told The Chicago Tribune late that March. "If I didn't pitch well, I knew I wouldn't make the club." Wapnick didn't make the club. He played the year at AAA Vancouver. Closing out the year, though, he tried to finished strong. He told The Times with two weeks left, he'd been over-thinking his mechanics. He finally decided to do it his own way. "Whether or not I'll make it to the big leagues again is something I really can't worry about right now," Wapnick told The Times. "For the next two weeks, I just have to concentrate on being a good pitcher, which is something I haven't been for most of this year." Wapnick ended up with an ERA on the season of 4.42, in 39 outings. He played one more season, with the Mariners at AAA Calgary, finishing out his pro career without returning to the majors.